Modesty in summer can seem difficult. Protecting the boys of our home from summer skin is even harder. Heat is not a good reason to run around half naked (or mostly, as most girls at the pool seem to be). We are very, very fair skinned and don’t like the inconvenience and toxic ingredients in sunscreen, so we try to keep ourselves covered to protect from sunburn. Treat yourself with respect this summer by staying covered. Here are some ideas for the different aspects of summer life. Just a note; I always wear biker shorts underneath my dresses and skirts in summer. Summer days at Home: I like to wear Hawaiian Muumuu’s at home in summer. They are similar to an old lady house dress but in beautiful Hawaiian prints. The cotton is cool, loose and comfy. I do seldom wear these into town though. 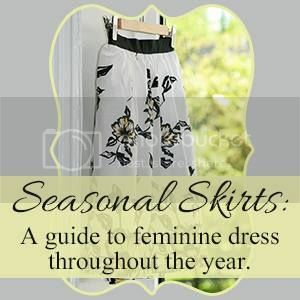 Denim skirts and camp blouses or t-shirts are a favorite around the house too. If I need to make a quick trip into town or we have surprise company, I feel very presentable. My favorite place to buy denim skirts is a local dress shop. Most of the regular prices at Maxine’s are $Ouch, but her sales are AMAZING (note the $10 rack outside the door) and the clothing is QUALITY. My favorite denim skirt from her store is at least 15 years old and showing little wear. Pictured here is a new one I was able to purchase on sale for $25. I love the pleats and comfy waistband! It’s sure to be my new favorite! Swimming: There are lots of modest swimsuit options now. My personal favorite is from Dressing for His Glory. (Sorry, we haven’t been swimming yet this year, so no pictures…) Kathryn prefers to wear a one-piece swimsuit under knee-length jean shorts and a t-shirt. Kristyn wears long board shorts with a swim shirt. The little girls wear suits I have made for them. I used biker short pattern for the bottoms and made a top with a large ruffle at the hem to match out of swim fabric. We all wear a bikini underneath as swim undies. Summer Outings: I prefer simple cotton skirts with a short sleeved denim top in the summer. I usually make mine, but one of my favorite places to get pretty, cotton skirts (like the one pictured above) is Ringger Clothing. The little girls wear t-shirt dresses with legging shorts. It’s so easy to add a cute fabric skirt to the bottom of any t-shirt for them. When I dress up, I like to wear regency dresses I've made from Sense and Sensibility Patterns. I made the one here from light-weight denim and country-fied it with apple appliques. I love the gingham trim. I cheated and used quilt binding. This dress was lots of fun to make! I think Earl was wanting to taste one of my apples! Missy Goat was trying to talk me out of a sip of coffee. Did you know goats like coffee?